The pygmy hog is a small wild pig weighing about 8.5 kg (10 lb). It lives in dense, tall grassland, where it feeds on roots, tubers and other vegetable matter, as well as insects and other invertebrates. Nests are built and used by both sexes at all times of the year. The pygmy hog is apparently non-territorial. It lives in small family groups of about 4 - 5 individuals, comprised of one or more adult females and accompanying juveniles, and occasionally an adult male. The pygmy hog formerly occurred throughout the terai region of India, Bhutan and Nepal. It is now found only in northwest Assam, India. By 1993 it was reduced to only two known, isolated populations in northwest Assam - the Manas Wildlife Sanctuary and the Barnadi Wildlife Sanctuary. 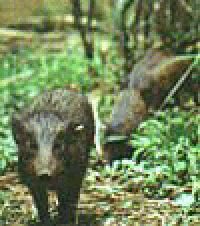 The continuing decline of the pygmy hog is due to the modification and elimination of its limited habitat by human settlement, agricultural encroachment, overgrazing by domestic livestock, commercial forestry, flood control projects, and civil unrest among Assamese ethnic groups. *** The pygmy hog is the world's smallest pig. *** The pygmy hog's nervous behavior and rapid movements may be explained by its lack of any defensive weapons, such as the wild boar's tusks. 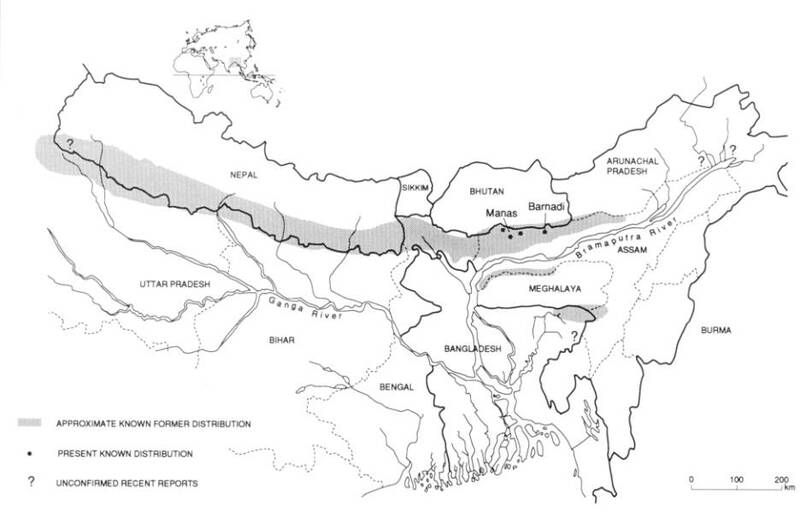 Most of the previous records of the pygmy hog's occurrence are from the terai region of India, Bhutan and Nepal, although it is known to have occurred in some areas south of the Brahmaputra River in south and southeast Assam (India). All confirmed reports of its occurrence during the last two decades have come from northwest Assam. By 1993 it was reduced to only two known, isolated populations in the few remaining tall grasslands of northwest Assam - the Manas Wildlife Sanctuary and the small Barnadi Wildlife Sanctuary. The continuing decline of the pygmy hog is due to the modification and elimination of its limited habitat by human settlement, agricultural encroachment, overgrazing by domestic livestock, commercial forestry, flood control projects, and civil unrest among Assamese ethnic groups. In addition, Manas was seriously threatened following the 1989 invasion of the sanctuary by an extremist faction of students, who controlled a large part of the core area and facilitated the influx of poachers. The pygmy hog's remaining grassland habitat is periodically burned during the dry season. During the post-burn period, it is either entirely dependent on any habitat left unburned or is forced to seek cover elsewhere (e.g. on neighboring tea estates). In either case, it is vulnerable to hunters who take advantage of the enforced concentration of game in any remaining cover during the post-burn period. Male pygmy hogs weigh about 8.5 kg (20 lb). Females are somewhat smaller. 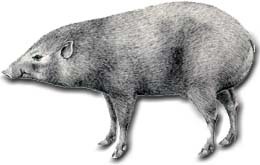 The pygmy hog is restricted to dense, tall riverine grassland habitat. Reproduction is strongly seasonal, with a birth peak coinciding with the onset of the monsoon (late April and May in western Assam). 2 - 6 young per litter (usually 3 - 4). The pygmy hog feeds on roots, tubers and other vegetable matter; also insects and other invertebrates. Nests are built and used by both sexes at all times of the year. The pygmy hog is apparently non-territorial. It lives in small family groups usually including about 4 - 5 individuals, up to 20, comprised of one or more adult females and accompanying juveniles. Adult males are usually solitary, but they may join estrous sows during the rut and associate loosely at other times of the year with the basic family groups. The pygmy hog occupies a home range of about 25 hectares (61 acres).